Disclosure: I received compensation in exchange for my post. Babies often begin teething at a very young age. 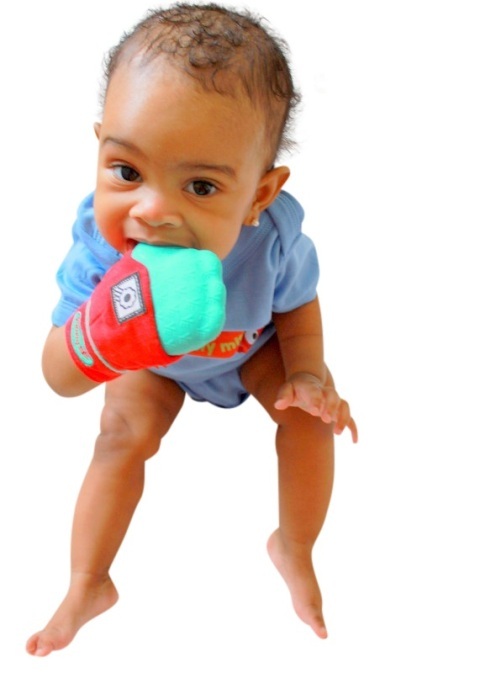 The daughter of the creators of Yummy Mitt began teething at two months! 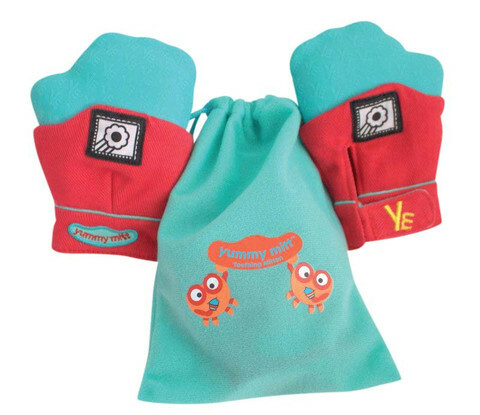 Since their daughter was too young to properly grasp traditional teething-relieving toys, they created the Yummy Mitt which slips over a child's hand like a mitten. 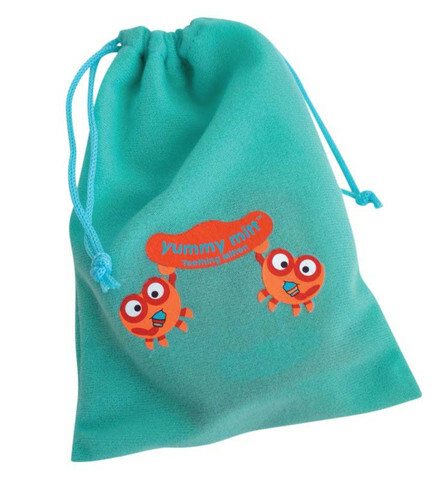 Inside the Yummy Mitt is an absorbent material that prevents moisture to baby's hand, plus the cotton on top absorbs moisture. This ingenious design combines 100% cotton and medical food grade silicone in a functional and stylish way. A baby's hands naturally end up in their mouth all the time, so the Yummy Mitt allows even the youngest babies to provide themselves relief. Parents are relieved of the task of constantly picking up teething toys dropped on the floor. 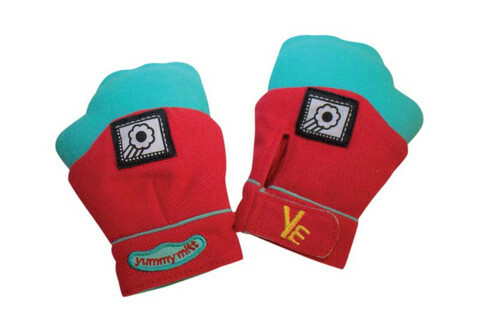 The Yummy Mitt has a slit and velcro closure that makes it easy to put on or take off baby's hand. Yummy Mitt's design provides multiple sensory textures, patterns, and colors, which makes baby's experience both enjoyable and developmentally beneficial. Each Yummy Mitt exceeds all safety requirements and is BPA-free, PVC-free, Lead-free, Latex-free, and Phthalates-free. Plus, it can also be tossed in the washer and dryer. Each Yummy Mitt comes with a convenient travel bag too! Visit www.darlyngandco.com to order your Yummy Mitt. What a fabulous baby shower gift or gift for a new mom! It's an affordable, safe, and very thoughtful gift that mom will certainly appreciate and baby will absolutely love. To enter to win, fill in the giveaway form below. You must be at least 18 years old and reside in the USA. Giveaway ends on 7/15/2015. Good luck! I love that you can "attach" it to baby in a gentle way so that they don't keep losing it. I also like that it doesn't have small parts like beads do. I like that it has multipe textures and colors. I like that the mitt secures to baby's hand allowing infant to provide teething relief to him/herself while simultaneously preventing gagging. I've learned that it is designed for babies who haven't developed the motor skills to hold traditional teething toys. I love the velcro so it stays put. I liked that it is designed ergonomically to replicate the natural feel and look of an infant's hand. I love that they are BPA,Latex,Lead ect. FREE and I really like that they are washable.